Nirvana Pool Villa. A beautifully presented detached single storey villa, with 185 sq.m of covered internal and external area, and 420 sq.m of landscaped gardens. Consisting of 3 bedrooms, 3 bathrooms (2 en-suite), and including full furniture with hand made fully fitted wardrobes in all 3 bedoroms. There is a modern fully fitted European kitchen with washing machine, oven, hob and fridge freezer. Direct line telephone, ADSL internet, cable TV, and 4 air conditioners are also included. Outside you have private landscaped gardens with a private swimming pool, and a large 2 car covered car port, with electric controlled garage door. 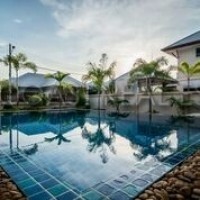 Located just a few minutes drive from Tesco/Lotus, and also within easy reach of Pattaya city, or the various beaches.